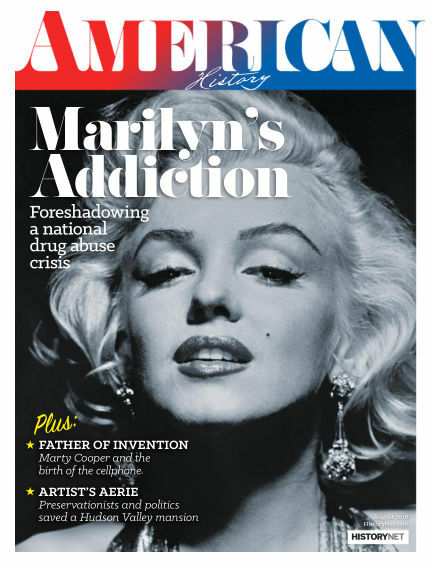 Marilyn is on the cover of American History‘s latest issue (dated August 2018), with an article inside by Robert Dorfman, Emily Berquist Soule, and Sukumar Desai MD, about her struggle with addiction to prescribed drugs and ultimate death by overdose prefigured the national opioid crisis, which has now reached epidemic proportions. Although the subject matter is bleak, the piece is well-researched and insightful. You can also read it in full here. “Then, as now, abuse of drugs was nationwide. But if prescription drug abuse had an epicenter in the 1950s, it was in Los Angeles at Schwab’s Pharmacy on Sunset Boulevard, where Orson Welles shopped, Ava Gardner worked the soda fountain, and F. Scott Fitzgerald reportedly had a heart attack buying cigarettes. At the pharmacy counter, celebrities and regular folks could get their prescriptions filled. In 1950s Hollywood, that meant barbiturates for nerves and amphetamines for energy and weight loss. One studio employee claimed that in those days most Hollywood actors were on prescription drugs. In that era, when psychological treatment was the province of the very privileged or the very ill, pharmaceuticals seemed to hold great promise for treating mental illness. More patients got relief without undergoing lobotomy, previously the recommended treatment. But the medical community knew prescription pharmaceuticals were addictive. Studies in the 1950s showed the best treatment for such addictions to be hospital detox followed by inpatient psychological care. Those convicted under federal drug laws could be forced to undergo such treatment, but Marilyn’s drug use never became a criminal matter. Her treatments were strictly voluntary. 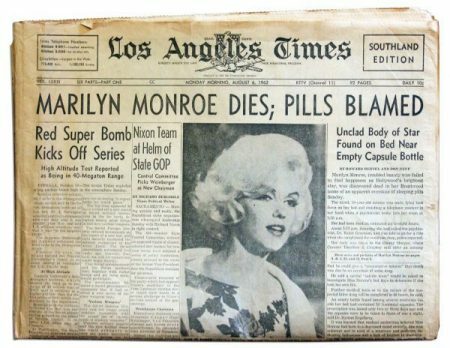 Dr Howard Markel has written an article for PBS about Marilyn’s fatal overdose. While there are some inaccuracies – for example, he says she had been drinking alcohol when she died, which is incorrect – his citing her prescription drug addiction as a ‘modern epidemic’ rings true. “Lonely and harassed, Marilyn found getting to sleep especially difficult. To counteract her insomnia, she often cracked open a Nembutal capsule (so that it would absorb faster into her bloodstream), added a chloral hydrate tablet (an old fashioned sedative better known in detective stories as a ‘Mickey Finn’, or ‘knockout drops’,), and washed them both down with a tumbler of champagne. This is a particularly lethal cocktail, not only because each of these drugs increase, or potentiate, the power of the other, but also because people who take this combination often forget how much they previously consumed, or whether they took them at all, and soon reach for another dose. What remains most cautionary to 21st century readers is that the majority of the substances Marilyn was abusing were prescribed to her by physicians, all of whom should have known better than to leave a mentally ill patient with such a large stash of deadly medications. The barbiturates that killed her are rarely, if ever prescribed, today. Nevertheless, Monroe, like Judy Garland, Michael Jackson, Prince, and too many other famous Hollywood stars who overdosed, was adept at manipulating her doctors to prescribe the drugs she craved and felt she needed to get through her tortured days and nights. This treacherous course worked, albeit haphazardly, until it didn’t work anymore and resulted in a talented young woman dying far too young.